The Republican from Stephenville — known for his social media bluster and omnipresent cowboy hat — bested his two challengers, avoiding a runoff. 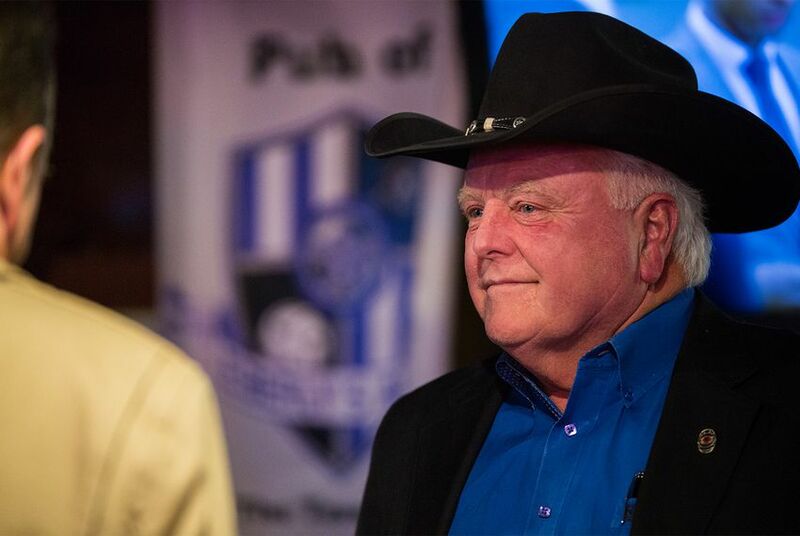 Sid Miller’s first term as agriculture commissioner has been marked by numerous high-profile controversies that cost him the support of some key conservative groups. But the Republican from Stephenville — a former state representative known for his social media bluster and trademark cowboy hat — prevailed in a big way in Tuesday’s primary election. He said his campaign hadn't done any polling but that he felt good going into Tuesday knowing he'd done everything he could do. The contest was considered by many political observers to be the most competitive statewide primary race, although Miller — an incumbent who secured the vast majority of key conservative endorsements — had always been favored to win. Miller, a nurseryman and horse breeder, faced a stiff challenge from Blocker, a former Austin lobbyist, ethics adviser and attorney from Fredricksburg who kicked off his campaign with a $750,000 loan to himself — which immediately put him ahead of Miller in cash on hand. Hogan, who ran for agriculture commissioner as a Democrat in 2014 and secured the nomination against all odds, refused to raise money or actively campaign, as he did four years ago. Blocker, who also hosts a conservative podcast, had previously indicated he would only run if Miller accepted a position with President Donald Trump’s U.S. Department of Agriculture. Early last year, Miller and three other Texans were on a short list to head the agency. None of them made the cut, although Miller — one of the first Texas Republicans to endorse Trump — didn’t hold it against the president, repeatedly calling himself “Trump’s man in Texas” on the campaign trail. Blocker, whose client list as a lobbyist included controversial agrochemical corporation Monsanto, declared his candidacy anyway in late November — weeks after dismissing Miller as an “embarrassment to the Republican Party” on one of his podcast episodes. On the campaign trail, Blocker seized on the many high-profile controversies and perceived missteps that have marked Miller’s first term, including his decisions to hike fees on farmers and ranchers after the Legislature rejected his sizable funding request, to dole out $400,000 in bonuses to agency employees and to bill taxpayers for personal, out-of-state trips that included receiving a “Jesus shot” in Oklahoma and competing in a Mississippi rodeo. Blocker also condemned Miller’s many inflammatory and factually questionable social media posts, which have included referring to Hillary Clinton as the c-word. And he attempted to paint Miller as soft on immigration for his support of a measure as a state legislator that allowed undocumented students to access in-state tuition if they graduated from high school in Texas — legislation that passed at the time with overwhelming GOP support. But political observers say Blocker faced an uphill task in positioning himself to the right of someone who once promoted bombing the Muslim world. In the past several election cycles, Republican primary voters have favored the most conservative candidates in statewide races, said Rice University political scientist Mark Jones. Blocker’s chances weren't helped by his past donations to Democratic candidates — something he says was part of his job as a lobbyist — and his decision to vote in the 2008 Democratic primary. He said that was a tactical vote promoted by conservative radio host Rush Limbaugh, who reasoned that Hillary Clinton would be a weaker presidential candidate than Barack Obama against U.S. Sen. John McCain. Miller repeatedly needled Blocker for that on the campaign trail, dismissing him as a "low-level lobbyist" and RINO — Republican in name only — and made no apologies for any of the things he’s done in his first term that some of the most conservative groups came to view as missteps. At a debate in Tyler last month, Miller said he couldn’t think of anything he’d do differently. He defended the bonuses he doled out as a much-needed morale booster, noted that he reimbursed taxpayers for the two out-of-state trips and that the Texas Rangers, who investigated those trips, never brought charges. "You don’t make a few people mad along the way, you’re not doing enough," Miller said Tuesday night when asked about some conservative groups withdrawing their support. "We had over 150 really good endorsements," he said. "We’d like to have them all, but we’ll work hard to get those the next election." Miller’s strength in the race was a sign of the Republican Party’s shift to the right and increasing preference for candidates who speak their minds and snub political correctness, said University of Houston political scientist Brandon Rottinghaus. He said Blocker has was seen as the establishment candidate in the race for focusing on fiscal responsibility and good governance rather than trying to match Miller’s social media bluster. “Good governance has not been an effective political label in Texas politics for a long time,” Rottinghaus said. Miller will face retired Air Force Col. Kim Olson, a Democrat, in November. Jones said Miller's "controversial statements and at times less-than-professional image as agriculture commissioner" is likely to hurt him more in the general election. But with the state's strong Republican bent and other factors, including straight-ticket voting and a popular Republican governor, Jones said Miller is "a virtual lock to be re-elected to a second term in November." Still, Miller said he would take the fall election just as seriously as the primary and that he plans to travel the state promoting "fiscal responsibility and lower taxes and pro-life — the whole [conservative] agenda." "We’re not taking that challenge lightly," he said. "We’re taking that very, very seriously." Disclosure: Rice University and the University of Houston have been financial supporters of The Texas Tribune, a nonprofit, nonpartisan news organization that is funded in part by donations from members, foundations and corporate sponsors. Financial supporters play no role in the Tribune's journalism. Find a complete list of them here.